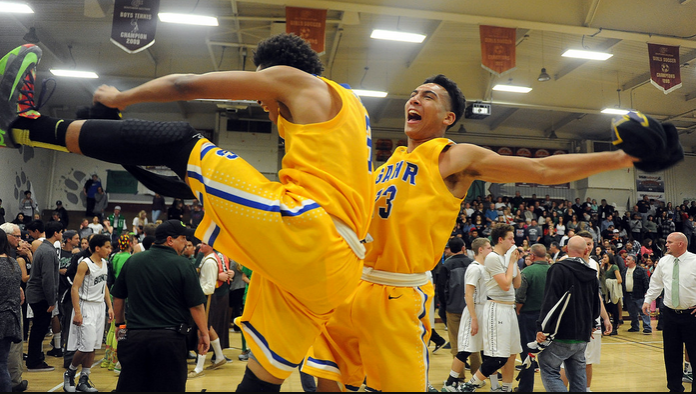 Check out the Bonita-Gahr photo gallery. Gahr surges past Bonita: The Gahr Gladiators have a lot of weapons in their offensive arsenal. But Friday night it was Gregory Carlyle providing the punch and leading his team to an 84-73 win over Bonita in Division 3AA semifinal at Claremont High School. Carlyle had 41 points, 24 of those coming in the first half of a game that was a battle all the way. Glendora shots don’t fall: The atmosphere was back at Glendora, but the magic on the court was nowhere to be found. Glendora was hoping to recapture the glory that produced four championships under legendary coach Mike LeDuc more than a decade ago with three titles in the 1990s and another in 2001. But the second-seeded Tartans missed shot after shot and were never in it, knocked out by seventh-seeded Elsinore 53-30 in the CIF-SS Division 2AA quarterfinals on Friday. Elsinore (22-8) moves on to face either fourth-seeded Lawndale or Mira Costa in Tuesday’s semifinals, while the Tartans finish 25-5. Walnut’s dream run ends: The Loyola High School boys basketball team put an end to Walnut’s run in the CIF-SS Division 1A playoffs with a 93-78 quarterfinals home victory Friday night. Loyola’s Max Hazzard nailed three 3-pointers in a row in the second quarter to burst the Cubs’ lead into double-digits, and the No. 1 seed didn’t let the Mustangs (25-6) back into the game after that. Diamond Ranch’s best season ends: There will be no CIF-Southern Section championship appearance for the Diamond Ranch High School boys basketball team. With a big second half scoring surge that included 11 3-pointers, Sonora High School easily defeated Diamond Ranch, 76-56, in the CIF-SS Division 3AA semifinals Friday night. Sonora (27-4) will take on Gahr, an 84-73 winner over Bonita, in the championship next week. Redondo Union at Damien, 7 p.m.
Cinderella Rowland knocked out: Playing in a steady drizzle, second-seeded Monrovia got two goals from Ulises Avila and dominated the midfield as it knocked off Rowland 3-0 in a quarterfinal game of the CIF-Southern Section Division 6 boys soccer playoffs on Friday. The Wildcats will play the winner of the Vista del Lago-La Canada game on Tuesday. They would be at home against Vista del Lago and on the road against Rio Hondo League rival La Canada. 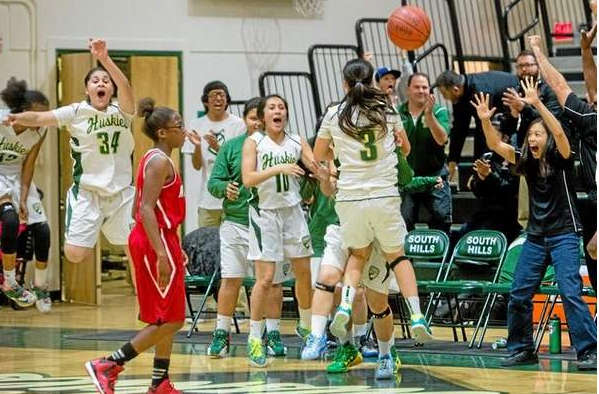 SOUTH HILLS IN SEMIS FOR FIRST TIME IN 23 YEARS: Sixth-seeded South Hills earned its first trip to the CIF Southern Section Division 3AA semifinals since 1992 following a 50-47 win over third-seeded Antelope Valley on Wednesday night. The last time the Huskies went to the semifinals, head coach Tiffany Liang (nee Hall) was the point guard who led her team to the CIF championship game. Duarte falls to power Harvard-Westlake: The Harvard-Westlake High girls basketball team ended Duarte’s eight-game winning streak, starting both halves on fire and holding on for a 73-51 road victory in the quarterfinals of the CIF-SS Division 4AA playoffs Wednesday night. The No. 2-seeded Wolverines (20-11) needed just over two minutes to take an 11-0 lead over their seventh-seeded Falcons, and they started the second half with a similar run, scoring 15 of the first 17 points. That was all they needed, actually getting outscored 49-47 the rest of the game. Walnut bows out: Perhaps it was only appropriate that the game ended with one more rebound by Eisenhower. Los Altos advances to Saturday’s CIF-SS Division 5 championship with a 9-5 win over Redlands East Valley. Los Altos will play Palm Desert, an 11-9 winner over Charter Oak, in Irvine. The time of Saturday’s championship will be determined Thursday. 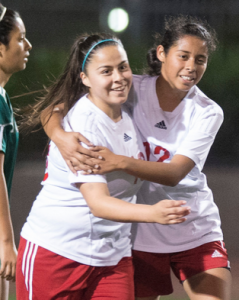 Foothill Tech 16, San Dimas 4 — Alondra Reynoso and Hailey Gonzalez each scored twice for the Saints (20-11) but it was not enough in the Division 7 semifinals loss. Goalie Shelby Garcia had nine saves for San Dimas.